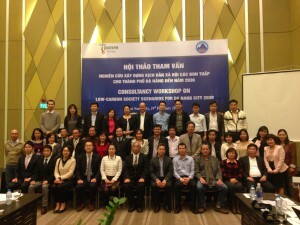 LoCARNet, MHIR, NIES, Kyoto University, E-Konzal and ISPONRE organised a Technical Consultant Workshop (CWS) on the 29th February in Da Nang city, Vietnam. About 50 researchers and government officials were gathered in and outside Vietnam. 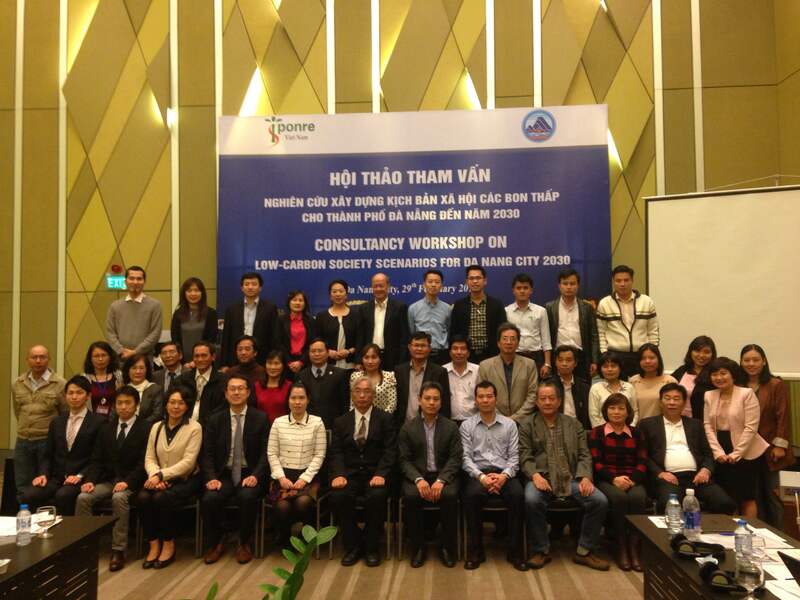 The workshop focused on sharing and consulting LCS research results of Da Nang city and Ho Chi Minh city with line depts., relevant sectors, cities and other stakeholders. It also aimed at connecting with other mitigation, energy saving programs in Da Nang city. The report of each presentation and panel discussion are as follows. Dr. Luong Quang Huy from DMHCC presented about Vietnam’s INDC, which indicates the GHG emissions will be reduced 8% voluntarily by 2030 with domestic resources under the BAU. This contribution could be increased up to 25% with international supports as well as Vietnam’s effort such as developing energy-saving program, formulating Law on Energy Conservation and Saving with a number of pilot projects. Dr. Huy explained that the Government will formulate a decree concerning on the responsibilities and roles of each ministry, local government etc. for INDC implementation after the Paris Agreement, it’s expected that the Law on Climate Change will be developed and come into effect soon. He also mentioned about some challenges in Vietnam such as incomplete National GHG inventory and MRV system, inadequate policies and guidance for NAMA development and so on. Dr. Nguyen Trung Viet from Ho Chi Minh CCCO shared his experience on the development of Action Plan responding to climate change of Ho Chi Minh city, especially on Water and Power sector because their good information management system facilitates for MRV activities. He mentioned that the building sector also made a great effort to develop the guidelines for Green Building. Dr. Viet explained about the City’s orientation for 2016 – 2020 period. It is focusing on capacity building & awareness raising programmes, and so on. HCMC also developed their own target for CO2 reduction level by 2020, focusing on two major arears, including energy and waste management. Dr. Nguyen Tung Lam from ISPONRE presented about his study on Low-carbon Development plan for Da Nang city using AIM methodology. The results from the study shows that Da Nang city can reduce up to 19% of total GHG emissions in 2030CM. This amount is between 10 – 20% National Reduction target as declared in the Green Growth Strategy and within 8 – 25% as mentioned in the Vietnam’s INDC. This study considered the year 2013 as a base year for their calculation and their target year is up to 2030. ExSS (Extended Snapshot Tool) has been utilized for estimating future GHG emissions and reductions. In addition, Input –Output Tables (IOTs) has been used to describe the sale and purchase relationship between producers and consumers within an economy. Meanwhile, Energy balance tables (EBTs) is used to illustrate general energy flow. Area of focused for this reduction plan will be industry and transportation, besides energy efficiency, smart building and green energy. Dr. Pham Ngoc Bao, IGES introduced results of joint research which was carried out as part of the Yokohama Y-PORT Center project, coordinated by IGES, Mizuho Information & Research Institute Co. Ltd (needs assessments), Osumi Co. Ltd. (technical assessments), and Ebara Vietnam Company, Inc. (advisor). This JCM Feasibility Study conducted an examination on updates to the latest low-carbon, energy-saving pumps. Dr. Bao introduced three major outputs from the study. Regarding the cost of introduction, the study confirmed the self-financing capacity of DAWACO and clarified the possibility of updating pumps without additional financial support measures if the subsidy rate for JCM technical assistance is about 40% or higher. The study confirmed if the investment is at the levels mentioned above for JCM assistance, there is a possibility to facilitate “Nominate Tendering” in tenders for pump updates through the DPC and DPI. Mr. Tran An presented on pilot model of utilizing solar panel for power generation at household level in Da Nang city. He explained the roof solar panel and wind-mill system which are installed in his house for power generation for daily life activities. Regarding his report, this system make his family can access to power 24 hour under any weather condition and it helps to save up to 50% of power cost. He explained that the challenges for installing this system is initial cost. To reduce the cost, he used the second-hand accessories such as batteries. In order to scale-up this model, appropriate attention should be given to the need for professional maintenance services. At the panel discussion, the reliability of the input data and outputs of these studies became one of the main topics. The importance of passing on these information to top policy makers, public and business sector was also mentioned. They concluded that they should continue updating the input data step-by-step so that the findings will become more realistic and truly reflect the actual situation of Da Nang. Meanwhile, in this stage it is also important to help Da Nang city to see an overall picture, and would like emphasize on improving the understanding of research process itself.